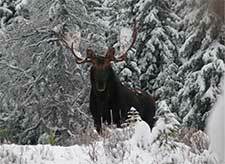 If dreaming of moose hunting consumes you, then Big Country Outfitters is the place to visit. Your host Mike Hawkridge will see to it you are offered every opportunity to harvest the animal you are after. 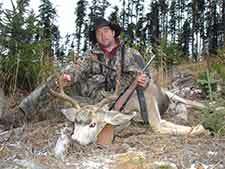 Located in central British Columbia, the prime hunting grounds of the Caribou offers many species to hunt. Big Country specialize in moose and monster black bear hunts, but can also deliver: wolf, mule deer, cougar, lynx and mountain goat hunts. I have had the privilege to hunt the general area of Big Country for many years. I can attest to the fine animals that are in the area. With Mike as your guide you can be assured of a great hunt while gathering everlasting memories to return home with. The moose of central British Columbia are not as large as their northern cousins but I can assure you they taste very good. Visit our moose recipes page to see how we cook them up. Moose in this area of British Columbia will dress out in the range of 450 – 600 pounds (200 – 270 kg) with some real monsters tipping the scales at over 700 pounds (318 kg). Of course it will depend on your decision; are you looking to fill the freezer or are you after a wall hanger. Moose antler spread can range from a young spike up to 50 inches wide and more. If you are looking for a real big one you will have to show restraint... there will be many smaller ones you will need to pass on before you find the one you are after. While out scouring the country side, Mike the owner of Big Country Outfitters often sees sights such as this. What a beautiful moose this is! 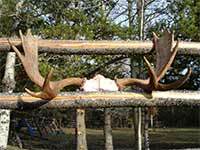 A customers moose rack rest on the fence waiting transport to its new home. 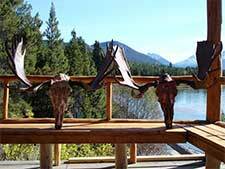 A couple of moose antler sets propped up for a photo opp. There were a couple very happy customers heading home after this trip. 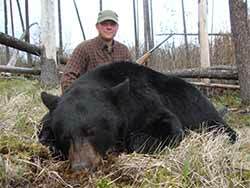 Mike at Big Country Outfitters also takes his clients out for black bear. This big boy was taken during the 2011 spring bear season. 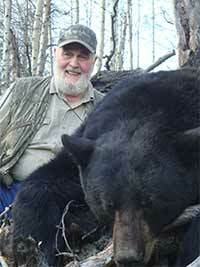 Mike confidently encourages his clients to book a combination hunt for moose and black bear. If you are going to travel all that distance you may as well cash in on the bounty. A gorgeous bear. This client took this bear at 30 yards... a heart stopping experience to be sure. In British Columbia central regions, wolf populations are growing. So much so the government has removed restrictions from the season and bag limits. Big Country has the wolf harvest figured out. 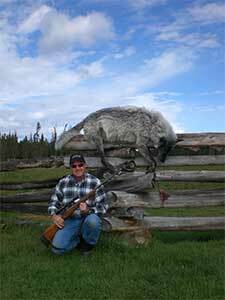 Mike has had his clients take many wolves in his hunting area, some of which have made the record books. Mule deer abound in the region. Here is Mike with a nice four pointer he took out in a pine cut block. If you are considering coming to Canada to hunt big game then Big Country Outfitters should be your first call. The Chilcotin plateau of central British Columbia holds some of the best hunting the province has to offer. With diverse wild game species to hunt you will not go home disappointed. Talk to Mike, he runs a first class outfit with an attitude that you will be hard pressed to find anywhere else. Contact Big Country, and be sure and tell him that All-About-Moose.com sent you.